This video captures the difference between Trump and Obama. Watch as President Trump asserts himself, when he senses that another member of NATO is trying to minimize him, ergo minimize America. WATCH: Pres. 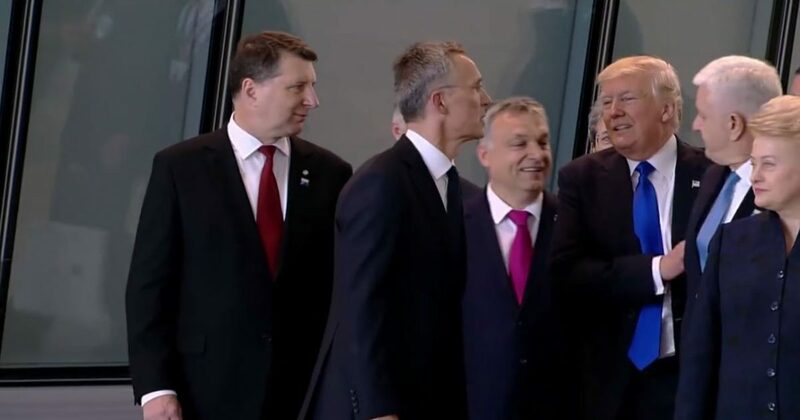 Trump places his hand on a fellow NATO leader and moves him aside to return to the front of the group amid ceremonies marking the new NATO headquarters in Brussels. One can only imagine what Obama would have done. Actually, we know what he would have done…BOWED! President Trump was not to be pushed aside, as he had an agenda at this meeting. NATO should pay its bills. President Donald Trump on Thursday chided NATO member countries directly for not meeting their financial commitments to the alliance and declined to reiterate US commitment to the alliance’s mutual defense pledge. “Members of the alliance must finally contribute their fair share and meet their financial obligations,” Trump told the heads of state, who stood silently — some shifting uncomfortably — behind him. The call appeared to reveal Trump’s continued misunderstanding of NATO members’ defense commitments. While Trump argued that many of the allies “owe massive amounts of money from past years,” the 2% defense spending benchmark that allies must meet is designed to boost their military, not to funnel money to NATO or other allies. For those keeping score, candidate-Trump said this was one of his objectives, and the Left scoffed. They accused Trump of mocking NATO. March 21, 2016 — Trump participates in a CNN town hall later the same day. He’s asked directly about NATO by host Wolf Blitzer, and again cites the costs to the U.S.
CNN’s Blitzer: Do you think the United States needs to rethink U.S. involvement in NATO? Trump: Yes, because it’s costing us too much money. And frankly they have to put up more money. They’re going to have to put some up also. We’re playing disproportionately. It’s too much. And frankly it’s a different world than it was when we originally conceived of the idea. And everybody got together. As you can clearly see, Trump’s comments were based on the notion that NATO wasn’t paying its bills. We have a term for that: deadbeat. Deadbeat dads don’t pay child support, for example. Deadbeat nations don’t pay NATO support. In the end, the countries of NATO have seen the light. And it was poetic justice that President Trump didn’t allow some dude to push him or America around.